Find out about how the salivary glands work and how common cancer of the salivary gland cancer is. As well as the 3 major pairs of salivary glands we have over 600 smaller, minor salivary glands throughout the lining of the mouth and throat. Most salivary gland cancers start in the parotid glands. Around 8 in 10 (around 80%) salivary gland cancers start here. Just over 1 in 10 (just over 10%) start in the submandibular glands. The rest start in either the sublingual glands or the minor glands. It is much more common to have a non cancerous (benign) lump in these glands, than cancer. Around 3 out of 4 tumours in the parotid gland (around 75%) are benign. Around half (around 50%) of the tumours found in the submandibular glands are benign. 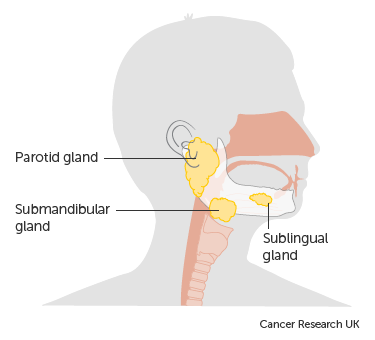 Sublingual gland tumours are very rare, but are often cancer. There are a number of different types of cells in the salivary glands. Cancer can start in any of these cells. Your exact type of salivary gland cancer will depend on which cell type your cancer started in. Salivary gland cancer is a very rare cancer. About 720 people are diagnosed with salivary gland cancer in the UK every year. It is slightly more common in men than women. The number of people getting salivary cancer has remained stable in recent years. We don’t know what causes salivary gland cancer but several factors can increase your risk.